Fireworks displays will again be one of the main attractions of today’s celebration of the UAE National Day across the country. Wherever you are, chances are there is a fireworks display somewhere near tonight to mark the 47th founding year of the UAE. If you want to see some of the more spectacular ones, here are the places to be. 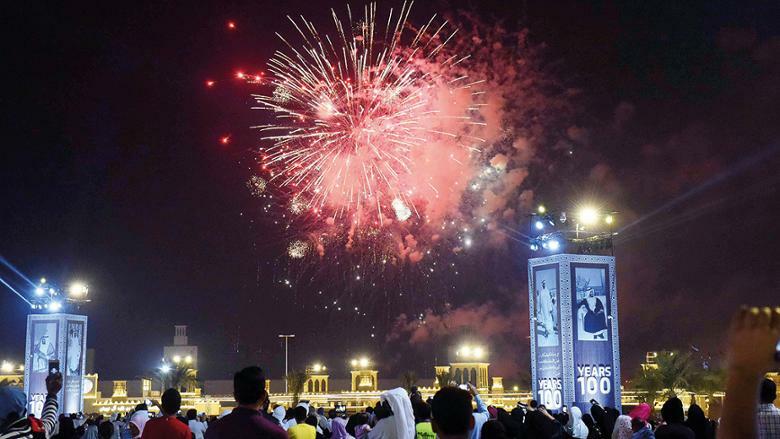 The UAE capital’s night skies come alive with fireworks displays in four locations. Fireworks at the Shaikh Zayed Heritage Festival, Hazza Bin Zayed Stadium and Madinat Zayed, Al Dahfra will be at 8pm. Or head over to the Abu Dhabi Corniche for a 9pm display, while from 4-5pm there is also an amazing showcase of aerial manoeuvres by Al Fursan, with special appearances from the air force’s Mirage 2000 and F-16 jets. Apart from various activities for the entire family, including free entertainment, a car showcase, kartzone and heritage village, the Yas Marina Circuit will also host a fireworks display at 9pm. The luxury hotel will launch a 10-minute fireworks display from 8.30pm, while there is also an audio-visual spectacle featuring a laser show and large video projection at the Triumphal Arch. The hotel, which will be draped in the UAE colours, will also host an Emirati dancing exhibition at 4pm and various activities for children. 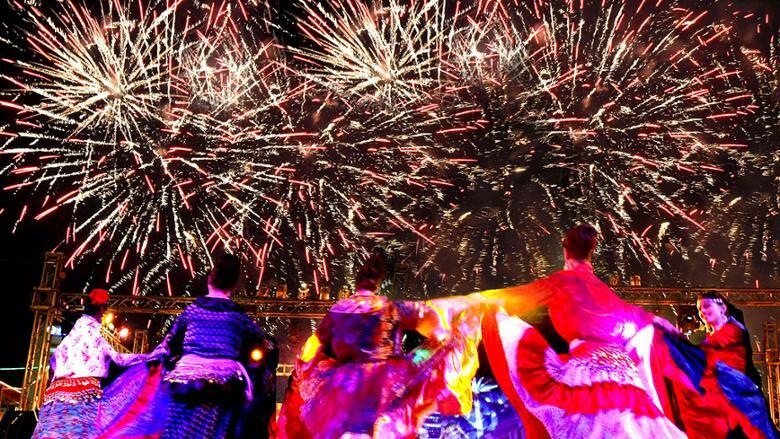 Amid a sea of UAE colours — more than 50,000 UAE flags and more than 30,000 UAE flags and shawls will be distributed to guests — one of Dubai’s favourite winter destinations will host a “Mega Musical Fireworks display” tonight from 9pm. This is on top of several activities throughout the day, including a special concert by Emirati star Hamad Al Ameri at the Main Stage, also at 9pm. Global Village will be open today from 4pm until 1am. Entry fee is Dh15. 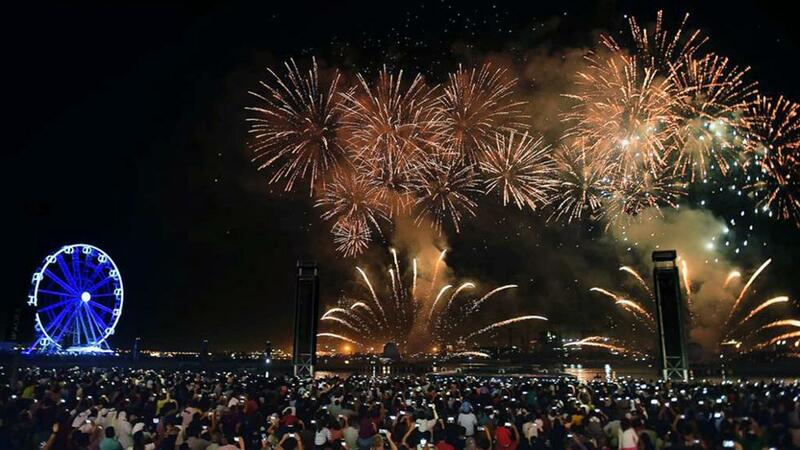 Amid traditional Emirati dance, Arabian music, roaming mascots and LED Cyr wheel performers, The Beach will celebrate the occasion with a fireworks display at 8pm. Dubai’s newest beach hang-out lights up again to celebrate the occasion at 9pm, to be followed by a free concert by Emirati star Mohammad Al Shehhi. Also catch a seven-metre artwork depicting the UAE flag. Chill out at the mall’s Festival Bay with various activities from 2pm, highlighted by two special fireworks displays followed by special Imagine light shows at 8pm and 10pm. For those looking for creekside entertainment, Al Seef will host live shows from 5pm featuring performances by Ayala and Garbiya bands and Razfa dancers, as well as a dance class for kids, punctuated by a fireworks display at 8.30pm. The emirate’s official activities will be held today at Flag Island, with a fireworks display taking centrestage.